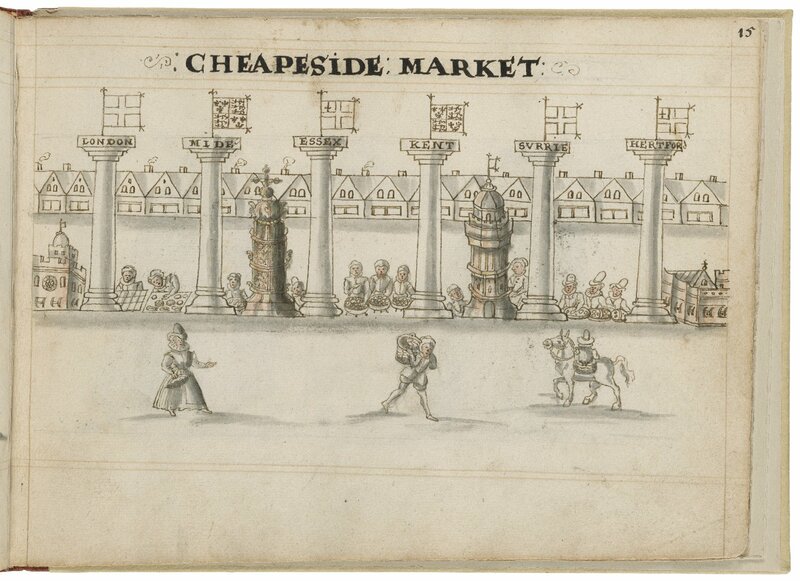 Drawing of Cheapside by Hugh Alley. Image courtesy of the Folger Digital Image Collection. There are three octangular compartments, and each is supported by eight slender columns. Its height is calculated at about thirty-six feet; the first storey being about twenty feet, the second, ten, and the third, six. Amongst the statues which ornamented the structure may be mentioned, in the first niche, most likely, a contemporaneous pope, round the base of the second were four apostles, and above them was placed the Virgin, with the infant Jesus in her arms. Four standing figures filled the top niche, and a cross, surmounted with the emblematic dove, completed the ornamentation, which was extremely rich. 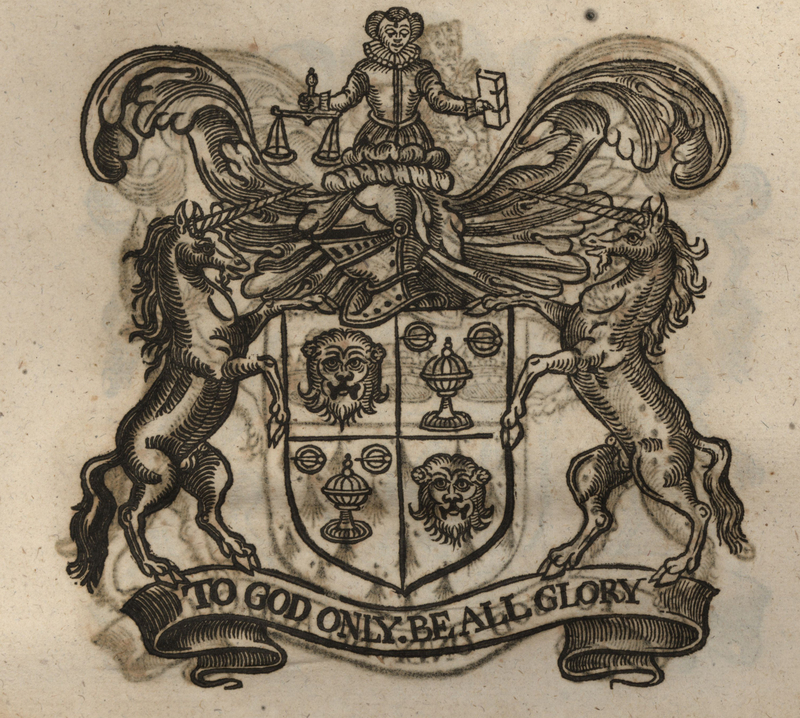 For a woodcut image of the Cross as it appeared in the 1640s, see the title page of The Dolefull lamentation (sig. A1r). 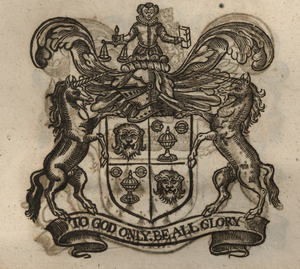 A similar picture appeared on the title page of several pamphlets published during the final controversy over the Cross. Steps led to the first of four levels of statuary niches. The monument was topped by a Greek cross. The Cross, pictured but not labelled on the Agas map, stood in Cheapside between Friday Street and Wood Street. St. Peter Westcheap lay to its west, on the north side of Cheapside. The prestigious shops of Goldsmiths’ Row were located to the east of the Cross, on the south side of Cheapside. The Standard in Cheapside (also known as the Cheap Standard), a square pillar/conduit that was also a ceremonial site, lay further to the east (Brissenden xi). In the Cheap Ward section of A Survey of London, John Stow states that the Cross was originally built in 1290 at the behest of Edward I in memory of his wife, Queene Elianor [Eleanor of Castile] (1.265). The Queen died at Harby, near Lincoln (Andrews 138). Her body was brought to Westminster Abbey for burial, and the King caused a stately crosse of stone [...] with the Queenes Image and armes vpon it to be erected at each place where her body rested on the way (Stow 1.265–66). The Cheapside Cross, built at an original cost of £300, was one of the most elaborate of the twelve Eleanor Crosses (Wheatley 167). It was a site for civic pageantry and notable events throughout its existence. The Cross was the starting point for jousts and horse races in the reign of Edward III (Stow 1.215). Henry V’s victorious return from the battle of Agincourt in 1415 was celebrated with a royal entry featuring a model castle at Cheapside Cross, with a bridge from its gatehouse to the ground, over which a choir of maidens, dressed in virginal white, came out to greet the king, singing, Welcome Henry the Fifth, King of England and of France (Keen 115). In 1441, London’s Lord Mayor obtained permission of Henry VI to rebuild the Cross, being by length of time decayed [...] in more beautifull manner for the honor of the citie (Stow 1.266). This new Cross was completed in 1486. During the first half of the Tudor period, the Cross was freshly gilded nearly every decade for important visitors and occasions: in 1522 for the visit of Charles I of Spain (by then Holy Roman Emperor Charles V); in 1533, for the coronation of Anne Boleyn; for the coronation of Edward VI; and in 1554, for the coronation of Philip, the Spanish consort of Mary. No pageant took place at the Cross in the latter case. Rather, as John Elder tells us, Their majesties [...] passinge through Chepeside, where they perceiving the crosse thereof, which was with fine gold richely gilded, they staied a litle lookinge thereon [...] where also the kinges highnes, perceaving the crucifix in the top thereof, very humblie put of his cap (149). During the reign of Elizabeth I, the Cross became a bone of contention between recusant Catholics, defenders of the established Church of England, and iconoclastic Protestant dissenters. At first, the controversy simmered under the surface of official communications. Stow notes the efforts of city worthies to have the Cross removed because it obstructed carriage traffic as they alleged (1.266). Then, on 21 June 1581, during the night, images on the lowest level of the Cross were vandalized. Although a reward was offered, the perpetrators were not found. The Cross remained in this state, with the broken statue of the Virgin Mary tied to the monument with ropes, until 1595, when partial repairs were undertaken. In about 1596, a gray marble tabernacle enclosing an alabaster statue of the goddess Diana was set up under the defaced image of the resurrected Christ. This statue functioned for a time as a conduit. A more overt attempt to dismantle the Cross took place in 1599. According to Stow’s revised Survey of 1603, there were fears that the Cross would fall and harm people in the street, as the wood had rotted within the lead casing and the arms of the cross on top were bending (1.267). The structure was scaffolded, and the top taken down. There was discussion of removing it entirely. However, Elizabeth’s counsellors wrote to Lord Mayor Nicholas Mosley conveying the Queen’s command that the Cross be repaired forthwith. Elizabeth I had steered a moderate course in matters of religion that was unsatisfactory to many Puritan worthies. It is therefore unsurprising that the Cross stood headless for more than a year afterward. The citizens of London had appealed to George Abbott, the Vice-Chancellor of Oxford University, in January 1600 for an opinion. Abbott’s view was that images of the Trinity such as those that adorned the Cross in Cheapside were unlawful according to Scripture (sig. A3r). He felt the opportunity should be taken to remove the Cross, as it encouraged idolatry and recusance: the Croſs in Cheapſide hath many in the twilight and morning early which doe reverence before it (sig. B1r). However, according to Stow, Elizabeth’s counsellors in greater number remonstrated, and a plain gilt cross was set on top (1.267). Henry Wheatley states that the Cross was altered so much in 1600 that it may be said to have been rebuilt (167). Henry Peacham dates the protective iron fence around the monument to preparations for the coronation of King James I (sig. A3r). The Cross still had its adherents. An anonymous ballad sheet published in 1630, Cheapſides Triumphs, and Chyrones Croſſes Lamentation (STC 5104.5; EBBA 20266), expresses pride in the refurbished monument. The text praises the City’s tender care: / to preserue their rich & ſumptuous buildings (19–20), and appeals to the City to save Charing Cross also. Even as the final campaign against the Cross began in 1641, The Dolefull lamentation (Wing D1837), an anti-Puritan tract, assailed the disorder caused by religious controversy, including attacks on the Cross. In this case, the personified Cross, which had once again been vandalized, gave a court deposition: I the foreſaid Iaſper Croſſe was aſſaulted and battered in the Kings highway, by many violent and inſolent-minded people, or rather ill-affected Brethren (sig. A4r). To let a Croſſe ſtand as a Chriſtian ſigne. They never may have croſſes [silver coins] in their purſe. Henry Peacham, writing under the pseudonym of Ryhen Pameach, has the Cross affectingly relate her history to her sister, Charing Cross, as the two commiserate on their present danger. In 1642, as the first skirmishes of the English civil war took place, the Cross was once again defaced (Wheatley 168), and pamphlets anticipated, celebrated, or justified its pending downfall. By 1643, England was in the thick of civil war, and the forces of King Charles I seemed to be winning (Booth; Brenner 450). Robert Brenner suggests that, in response to the royalist menace, much of London appears to have been overtaken by a new wave of Puritan religious fervor, manifested especially in a rising tide of iconoclasm (450–51). Meanwhile, Charles I’s supporters continued to venerate the Cheapside Cross publicly by removing their hats and crossing themselves, even in broad daylight (The Down-falle of Dagon sig. A4r). Parliament issued a warrant for the Cross’s demolition, on or about 24 January (Booth). On 27 April 1643, London’s Common Council made a motion to have Cheapside Cross destroyed (Brenner 451). Robert Harley was deputed to carry out the work, with a troop of horse and two companies of foot soldiers (Andrews 144–45). The Cross was taken down on 2 May 1643, to evident public approval. After the Restoration, the Cheapside Cross was remembered and mentioned in several histories, pamphlets, and poems. As late as 1663, the spot where the Cross stood was still used for civic events. John Tatham’s 1663 Lord Mayor’s show, Londinum Triumphans (Wing T221) records a pageant there featuring a lively Figure repreſenting Albion or England, with the figure of London at her feet, and other cities around her (sig. C1r). More humbly, the Chimney Sweepers’ Sad Complaint (Wing C3897), a 1663 pamphlet, petitioned the City to restore the monument, not only because it was a graceful Ornament to this Famous City but also because the Cross had served the sweeps as an informal hiring hall, we having liberty to wait there every morning for imployment (sig. A2v). However, unlike Charing Cross, the Cheapside Cross has never been reconstructed. Abbott, George. Cheap-side crosse censured and condemned. London: n.p., 1641. Wing A63. Subscription. EEBO. Andrews, William. Old Church Lore. Hull: William Andrews, 1891. Reprint. Wakefield: EP Publishing, 1975. Booth, Roy. It must be called EBENEZAR : Cheapside Cross and a Puritan Replacement. Early Modern Whale. Blogspot. 2008. Open. Brenner, Robert. Merchants and Revolution: Commercial Change, Political Conflict, and London’s Overseas Traders, 1550–1653. Princeton: Princeton UP, 1993. Brissenden, Alan. Introduction. A Chaste Maid in Cheapside. By Thomas Middleton. 2nd ed. New Mermaids. London: A&C Black; New York: Norton, 2002. xi–xxxv. Elder, John. Appendix X: John Elder’s letter describing the arrival and marriage of King Philip, his triumphal entry into London, the legation of Cardinal Pole, &c. . To Lord Robert Stuart, c. 1554. The chronicle of Queen Jane, and of two years of Queen Mary, and especially of the rebellion of Sir Thomas Wyat: written by a Resident in the Tower of London. Ed. John Gough Nichols. London: Camden Society, 1850. Reprint. New York: AMS Press, 1968. 136–66. Reprint. as ACLS Humanities E-book. Ann Arbor: U of Michigan Scholarly Publishing Office, 2008. Patricia Fumerton, dir. English Broadside Ballad Archive. University of California at Santa Barbara. http://ebba.english.ucsb.edu/. Keen, Maurice Hugh. English Society in the Later Middle Ages, 1348–1500. London: Penguin, 1990. Nichols, John Gough. Appendix XV: Portraits of Edward VI. Literary Remains of King Edward the Sixth. Ed. John Gough Nichols. London, 1857. ccxliii–ccclx. Reprint. as ACLS Humanities E-book. Ann Arbor: U of Michigan Scholarly Publishing Office, 2008. Web. Peacham, Henry. A Dialogue between The Crosse in Cheap, and Charing Crosse. London, 1641. Wing P944. Reprint. EEBO. Web. Tatham, John. Londinum triumphans. London, 1663. Wing T221. Reprint. EEBO. Web. Taylor, John. A full and compleat Answer. London, 1642. EEBO. Reprint. Subscription. Wing T461. The Chimney-Sweepers Sad Complaint. London, 1663. . EEBO. Reprint. Subscription. Wing C3897. The Downe-fall of Dagon. London, 1642. Reprint. EEBO. Subscription. Wing D2084. The Popes proclamation. London, 1641. Wing P2939. Reprint. EEBO. Web. Wheatley, Henry B. Old Cheapside. The Antiquary 9 (1884): 164–68. Google Books. Web. Wing, Donald. Short Title Catalogue of Books Printed in England, Scotland, Ireland, Wales, and British America and of English Books Printed in Other Countries, 1641–1700. 3 vols. New York: Columbia UP, 1945–51. Devine, Marina. Cheapside Cross (Eleanor Cross). The Map of Early Modern London, edited by Janelle Jenstad, U of Victoria, 20 Jun. 2018, mapoflondon.uvic.ca/ELEA1.htm. Devine, Marina. Cheapside Cross (Eleanor Cross). The Map of Early Modern London. Ed. Janelle Jenstad. Victoria: University of Victoria. Accessed June 20, 2018. http://mapoflondon.uvic.ca/ELEA1.htm. Devine, M. 2018. Cheapside Cross (Eleanor Cross). In J. Jenstad (Ed), The Map of Early Modern London. Victoria: University of Victoria. Retrieved from http://mapoflondon.uvic.ca/ELEA1.htm. Politician, puritan, and member of parliament. Sheriff of London from 1590—1591 CE. Mayor from 1599—1600. Knighted in 1612.